See all of downtown Moscow at its best on this 3-hour private bike tour. This tour can be customized to make it a unique experience for you. Choose any bike route you like and it will certainly capture your heart. This private tour empowers you to see the heart of Moscow inside of the Boulevard Ring and see a ton of places. Explore non-touristy paths of the city, get a picture of the downtown area and have a great workout at the same time. 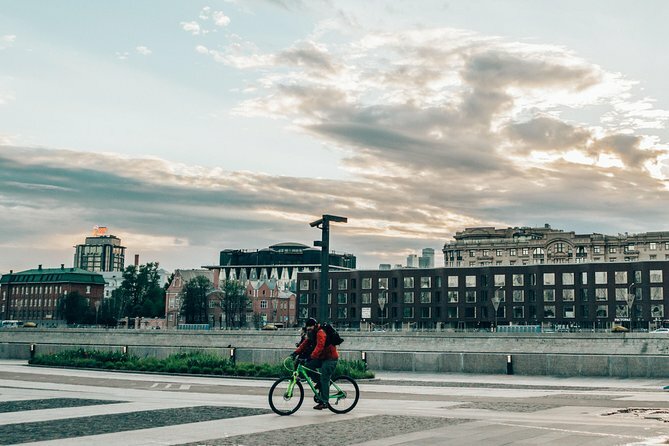 Bike along the Moskva River and test your photo skills. Get your must-do Kremlin selfie riding on bridges with panoramic views. See Red Square, Kremlin, Kitay Gorod with its old charming streets (Nikolskaya, Varvarka, Ilyinka). Learn about the Russian Revolution on Ploschad Revolutsii and hear the fun facts and stories about the Bolshoi theater on Theatrical Square, see the Eternal Flame in Alexander Garden. The places vary depending on the route you choose. Dive deep into the local culture. This private bike tour with a friendly local guide gives you a one-of-a-kind perspective of a bit of everything in 3 hours. Including must-see sights, local vibrant neighborhoods, progressive urban life of Moscow, astonishing photo opportunities, a touch of Russian history and culture, and lots of fun. Route 1 - Must-See route if it's your first time in Moscow and you want to cover all the main sights in a short time. In-depth experience and a lot of interesting fun facts at each landmark. Route 2 - This route is the best if you want to explore the heart of Moscow, the so-called White City. It goes through the places of cultural and national heritage, like the Boulevard Ring, and is completely cherished by locals. See the ancient architecture as we roll into the Old Town of Moscow. Route 3 - A dynamic route is the most scenic and includes many parks and gardens. Route 4 - A great route for those who prefer off-the-beaten-track to touristy landmarks.